The request form that an inmate is required to turn in MUST include a complete name, address and date of birth for everyone they intend to visit. Normal visitation is available on Saturday, Sunday and holidays from the hours of 8:00 a.m. to 10:00 p.m. On those days visitation is stopped for meals between the hours on 10:30 a.m. to 12:30 p.m. and 4:30 p.m. to 6:30 p.m. Inmates will be allowed only one (1) twenty (20) minute visit per day. Picture identification of the visitor will be required. The visitor must be eighteen (18) years old or older. If they are under eighteen (18) years of age and are an immediate family member, they may visit but must be accompanied by a parent or legal guardian. Inmates are required to fill out a visitor request form listing those who they wish to have visits with, which is turned into the detention center staff. Any visitor who is intoxicated, disrespectful or acts unruly will be turned away and may be banned from further visits. Special visits or extended visits will not be allowed unless approval is granted by the Detention Captain or Sergeant. 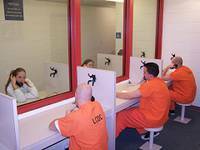 Visits between inmates and attorneys will be reasonable and will not be limited as to frequency but are requested to be held during the hours of 8:00 a.m. and 5:00 p.m. The privilege of attorney-client communication shall always be respected by the detention staff. The only things that may be brought to the detention center are a full book of stamps, medication and cash. Cash brought to the detention center must be deposited on the KIOSK in the public area and will be credited to the inmates' commissary account. Money can also be added to an account using www.smartdeposit.com (cannot be accessed immediately) or by calling 866-394-0490. A fee applies to any money added. When using any service, you will need the 5-digit permanent ID number of the inmate. The detention center will not accept personal checks or money orders. We will still allow government checks and payroll checks.